In 1812, the Synod of Virginia resolved to establish within its boundaries a theological seminary. Thus began Union Theological Seminary in Richmond, Virginia. To lead the school, the Rev. 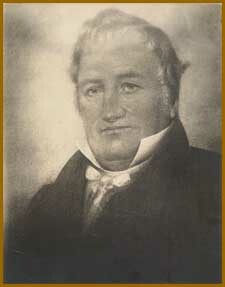 Dr. Moses Hoge was unanimously chosen to serve as the first professor of the fledgling institution, and he served faithfully in that capacity until his death in 1820. Then with Hoge’s death, the school languished for several years until the appointment of John Holt Rice, who began his duties on behalf of the Seminary in the latter half of 1823. In turn, Dr. Rice died early in September of 1831, and it is at this point that we turn to E.H. Gillette’s always lively, if somewhat ebullient, history for an account of Holt’s successor as head of Union Theological Seminary. “But a permanent successor of Dr. Rice as Theological Professor, one well worthy to wear his mantle, was found within the bounds of the Synod, and inaugurated April 11, 1832. “At the head of Liberty Hall–Washington College–stood, at the time of Dr. Rice’s death, a man who in the qualities of intellectual and moral greatness had scarcely a superior in his native State. This was George Addison Baxter, a graduate of the institution [i.e., Washington College] in 1796, and a theological pupil of the rector, William Graham. After laboring as a missionary for some time, he took charge of New London Academy, from which in 1798 he was called to the Professorship of Mathematics at Liberty Hall. Upon the death of the principal, Mr. Graham, in the following year, he was chosen to succeed him; and in this post he continued–officiating at the same time as pastor of New Monmouth and Lexington churches–until 1829. “Few men, for the same period of time, have undertaken so much; and fewer still have accomplished what he achieved. [And he performed his duties with great Christian love and magnanimity. His students at Washington College affectionately called him “Old Rex.”] In seasons of revival he was known to spend five hours each day in his college duties, and to preach every night for weeks together. His desire to devote himself exclusively to pastoral labor led him to relinquish his connection with the college; and two years afterward, in the autumn of 1831, he was called as Theological Professor to succeed Dr. Rice. “The Seminary at the time was in an embarrassed state, and the several vacations of the institution were devoted by Dr. Baxter to soliciting pecuniary aid on its behalf. Until his death, in 1841, he continued almost uninterruptedly to devote himself to the duties of his office. The successor to Dr. Baxter upon his death was Dr. Samuel B. Wilson, who for more than twenty years had been settled at Fredericksburg. “With a mind exceedingly well balanced, an understanding vast in its powers of comprehension and eminently profound and lucid, a judgment accurate and discriminating, and a memory remarkably retentive, he combined an amount of fervent emotion which in his pulpit utterance “sent forth his great thoughts in burning and melting masses.” Always clear, he was almost always convincing. He seemed to grasp a difficult subject and apprehend all its bearings almost by intuition. His power of condensation, moreover, was remarkable. Few ministers whose sermons, like his, extended to three-quarters of an hour, have been requested, as he was by his hearers, to preach longer. His prayers were brief but comprehensive. He rarely used the pen, and wrote but few of his lectures. In the pulpit he scorned the aid of even the briefest outline. Yet his words were well chosen and weighty. Nor were they made less impressive as the hearer gazed upon his tall, manly frame, and the expanded, massive brow on which the very majesty of mind seemed enthroned. He had imagination, and he had pathos; and in his preaching he not rarely had to struggle powerfully to suppress his emotions. His mind was more rapid than his words, and his heart kept pace with his intellect. In William Henry Foote’s Sketches of Virginia [p. 262-3], we read that Rev. Baxter’s mother “left among her descendants a memory precious for her exemplary piety and prudent conduct as a wife and mother, in situations calling every day for the exercise of Christian graces, and seldom offering occasion for the lofty display of any accomplishment. The lives of her children were her best eulogy. George Addison was the second son, and the third of eight children, all of whom he survived. Vigor, frankness, uprightness, and industry characterized all the members of the family, reared in the simplicity and hardships of a frontier life. The mother laid the foundations of morals and religion in her children while they were young; and expressed the most decided unwillingness to part with any of them till their faith in Christ was established. Her unremitting attention to the spiritual concerns of her children was followed by the unspeakable reward of seeing them all consistent professors of religion, according to the faith she trusted for her own salvation. The Bible, the Sabbath, the Assembly’s Catechism, the preaching of the gospel, family worship and private instruction were things of solemn interest to the family from the earliest recollections; and connected indissolubly with the memory of their parents, the influence was tender and perpetual. The image of the mother stood before the children rejoicing when their faith triumphed, and weeping when they sinned.” Blessed is the mother that knows her God-given power to raise covenant children.